A couple of weeks ago, I accidentally took a blogging break. For over 2 years now, I've blogged every day, with the exception of my holidays in August when I posted maybe once every 3 days. Suddenly, I found myself not posting for days on end. Admittedly, this was hardly a complete departure from blogging but it was just so not me. I've always prided myself on my consistency and, although I doubt there was anyone frantically refreshing my page and crying into their keyboards, it still stressed me out. However, I did learn some things from this unexpected break. To my surprise, although my views fell, my followers increased. Yes, I know. Again I'm going against all the blogging advice. It's about views, not follows, but we've already established my views dropped so give me this one victory please? Essentially, the biggest lesson I learned was that the world goes on and I won't erase all my hard work. People will still read, my stats went back up again as soon as I returned posting regularly and it was like nothing ever happened. Will I be doing again soon though? Probably not. I just can't handle the stress! I like this. 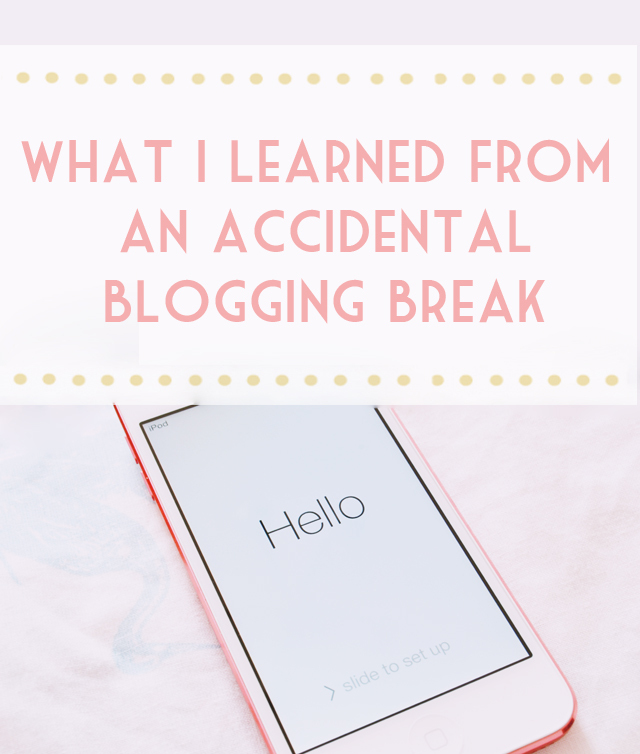 I always think the worst when I take a blogging break, and usually nothing at all happens when I do and my blog still goes on! I think I always feel like I'm giving up on my hard work but all it is is a well earned break. This is so interesting to read. I think there is always that pressure for bloggers to be consistent and keep posting but you are more likely to lose followers and readers if your content is rushed. I'm the same as you, although I hate to admit it aloud...I'm obsessed with stats! This is so true! I don't get the time to blog much and now with doing all of the overtime at work I get even less time to dedicate to it. Yet, even though I'll take weeks before a new post, the traffic and occasional follows randomly pop up! It's always good to take a break now and again if you want to! I often find once I come back from the break I'm feeling more pumped up and ready to write than ever! I took a two week break for my honeymoon and I thought everything would be ruined when I came back. While I was gone, someone had pinned one of my recipes and I actually had more views than when I was blogging regularly!